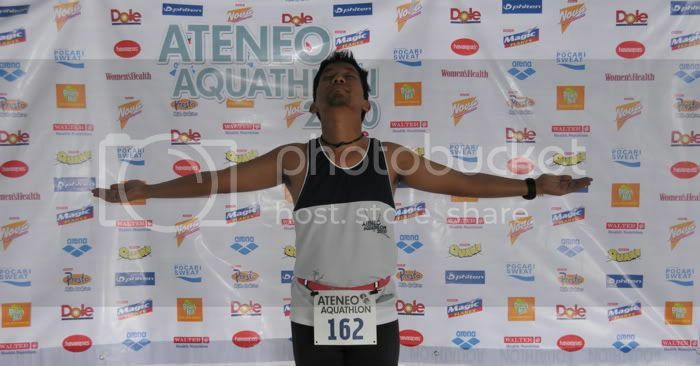 last month i took part in the ateneo aquathlon. my friend janice registered me and all i recall saying was that i wanted to be in the shortest distance. i may have renewed confidence in and around water but i'm not exactly the fastest swimmer i know. the aquathlon, after all, was still a race, and although i was nowhere near competitive, i always want to make a good showing. 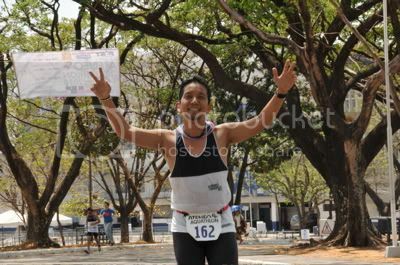 nevertheless, it was a lethargic morning on the day of the race. i got out of bed very late in the morning, thinking my category would not start until lunch time. but when i arrived at the ateneo covered courts, i found out that i was supposed to have started on the first few heats at 8am. there, i would have been overtaken by young boys who are barely even in their teens. so although i was already officially DNS (did not start), i still forked over my payment and prepared for the classic in my age group. manny pacquiao's fight was scheduled that same day, and a few people had backed out already. which didn't really improve my chances since i was clearly not in the running to win. besides, i had stopped my swimming lessons due to an ear infection which has since healed, and i wasn't even supposed to be swimming at the time. but i threw caution to the wind and decided that i wanted to do this. i've chickened out far too many times, it's almost embarrassing. but i still had about 2 hours before i would hit the pool so i got to see the earlier heats: girls and boys filled the small ateneo pool and turned it into a washing machine at gun start. it was like a B-movie piranha attack. 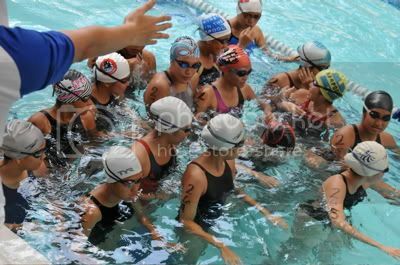 several of the young swimmers did tumble turns and emerged halfway in their laps. it was crazy. and i couldn't shake the disbelief that this was the 17-21 category. what are they feeding these kids? if it's darak, i'll have myself a generous helping. so anyway it was my age category's turn. there were so many participants in my field that there were 3 heats set off a minute apart. i joined the first heat and it was crazy fun. 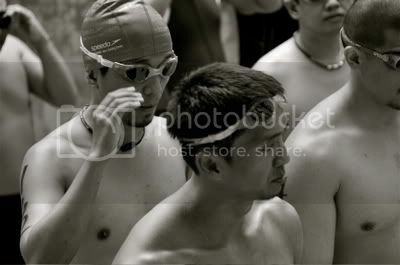 i had a very slow swim, and i was just really having fun, pausing at the end of the lap to pose for my photographer. but there were other really crazy swimmers out there, tugging my legs. i also got kicked very early. since the pool is only 25m long, we had to swim through all 8 lanes 3 times. i finished my swim in 16 minutes. it was among the 7 slowest times in my division! and it didn't help that i spent about 3 minutes in transition! yeesh! i was hoping to make good on the run part, which was 6km long, but i don't ever recall running under the intense midday sun. sure, ateneo's sprawling campus is shaded by the sparse canopy of acacia trees, but still the heat was unbearable. besides, i discovered that chlorine-treated water doesn't make for good hydration. i felt heavy in the belly, and i wasn't even through my first loop when i felt a sharp jab of pain. we had to run from the covered courts to moro, then through MVP's building, then out again to the loyola gym. but still: noon! summer! sun! is there a hospital in ateneo? i could've fainted from sunstroke! i eventually finished in 56 minutes and 6 seconds. i had improved my ranking in my category only by a bit, but still it was an average race for me. i really shouldn't plunge into things without proper training and conditioning, since i have a rather unkind opinion of people who take on mammoth tasks without understanding the size of their ordeals, and giving up. i sigh when i see people not finishing half marathons, and proffering poor alibis about not being in the zone. it's different to have a bad day -- which even the best athletes often have -- and to be completely unprepared for something. if you voluntarily put yourself in a situation that requires so much more than what you usually do, then own up to it, with all seriousness. regardless of our reasons -- for fitness, accolade, getting a nice action photo, to complete a bucket list, or because of peer pressure and for social networking -- we should at least know what we're up against, and be armed for the battle. automatic ba na kapag maging atenista ka nagiging guapo? haha. gusto ko maging bata ulit. i would start to get into sports! gusto magkaroon ng ganyang katawan din. haha. hindi ko alam. hindi rin ako atenista. pero, IKR! nasa huli ang pagsisisi talaga. lampa ako nung bata ako. hindi pa uso nun yung mga multi-sport events. basketball lang ang sikat. eh wala akong hand-eye coordination. haha. kunsabagay, hanggang ngayon, i do not excel in any sport. unless of course mountaineering were a sport... maybe it is, hindi nga lang competitive or contact. haha.